Fast-forward through two decades of building and repairing and tending all the animals that were brought or dumped here. We took in more from kill shelters and private citizens, and 20 years later, the Goathouse has become the lighthouse of how animals should be cared for and treated. Many other Organizations are taking inspiration from our work and even making improvements on our example. Shelters have become much more aware that we, Goathouse and all the other incredible Organizations out there are watching what they are do. With the great work of the “no Kill” movement, sustained by the individual Rescuers and Rescue Organizations, the percentage of animals killed in shelters is lowering every year. It took many, many years, but we finally closed and destroyed the gas chambers that were used almost everywhere in shelters in NC!!! Our commitment to the dignity and welfare of the animals is firm like the Statue of Liberty! Goathouse has a trust that makes this property, and any other property that belongs to me, the property of Goathouse Refuge. Our Trustees are 2 solid and capable people: the Mayor of Pittsboro; an attorney whose integrity and humanity make her one of the most beloved people in our County. The other is an anonymous but powerful individual who will turn every stone to keep Goathouse Refuge safe with all its creatures. We will publish the Trust on our Website, for everybody to see and for everybody to add to it by placing Goathouse in your will, by donating, every month, a sum to be added to the trust, or even donating when you win the lottery!!! 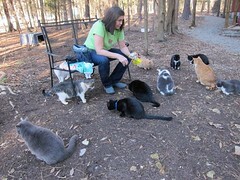 There are many ways to help us, and, right now, this coming Tuesday, is Giving Tuesday, PayPal will match all your donations and that will help pay our bills, to pay the wonderful people who clean, feed and care for the 300 kitties at the Refuge, and enable us to keep doing our work. Food is always needed; these are a bunch of hungry kitties!!! In the end, but first in my heart, is the gratitude I feel toward all the committed, solid, always present people who continually help Goathouse to become the Organization who gave and is giving life to so many thousands of adorable little hearts! I do, deeply, love you all!